Ah, lenses. 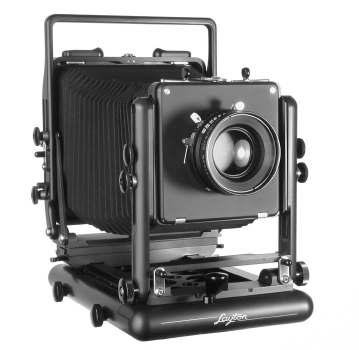 This is probably the most controversial aspect of large format photography. If you're not familar with the lenses, it's totally different than 35mm and medium format camera-lens system. Lenses are mounted on the camera with the lensboard and so you can almost use any brand of lens on any camera but not all the models or lenses of that brand. Not because they won't mount, but they won't work for the format size. Ok, what gives here? Well, it's easy and very complicated. The easy part is that you have to learn and understand image circle. This determines what lenses you can use for your format, remember there are a variety, with 4x5, 5x7, 8x10 and larger formats and a variety of odd sizes, mostly panoramic formats. Almost all lenses work for 4x5 but you have to learn the second part, which is movement. The larger image circle gives you more front and rear movement. And then there are the brands and models. There are lots of on-line resources including each brand's Website. Suffice it to say there are four major brands of recent production, Fuji, Nikon, Rodenstock and Schneider, but Nikon recently discontinued production of large format photography lenses. Once you decide the brand, you have to decide the lens series and focal length. It can't stress enough to take your time reserching and buying lenses. You want to minimize the cost and still get the most for your photography. A lens focusing on the inside of a lens cap on a shelf doesn't help your learn, and too many will only confuse you. I can only suggest to first decide a range of focal lengths you want, such as normal, wide angle and short telephoto by the type of photography you want to do. Once you get to lenses made within the last 20 years you really can't go wrong and new(er) lenses won't hurt. Many suggest focus on one brand you prefer and only make exceptions for particular lenses you find very useful. After that, it's a matter of opportunity, as many aren't readily available used and many new ones are special order. Patience is the best attribute when researching, selecting and buying lenses. I went through several iterations of choices over a year-plus before I actually bought any lenses. In the end I chose Schneider lenses, all near new, a 120mm f5.6 Super Symmar HM, a 180mm f5.6 APO-Symmar, and a 300mm f5.6 Symmar-S lenses. I will eventually add a 90mm and maybe a 150mm and a 360mm-480mm lenses as a learn what photography I do and want to do.